The police raid this week on the Ramat Hasharon home of Dutch-born activist Annelien Kisch comprised, to her, yet another sign that Israeli society rejects her “Western, anti-militaristic and peace-minded world view.” Opponents call it hypocritical for her to brandish Western values to justify breaking the law. Officers were looking in her house near Rothberg High School for evidence the 70-year-old Kisch had abetted suspected draft-dodgers in allegedly lying to army authorities to receive an exemption from service. Kirsch is the cofounder of New Profile, which encourages youths to avoid conscription. New Profile describes itself as a feminist group devoted to “demilitarizing” Israeli society. The home of Dutch cofounder Mirjam Hadar, a neighbor of Kisch, was also raided. The two women formed the group in 1998 together with Ruth Hiller from the U.S., who also lives in the Sharon area. Hadar, Kisch and five other people linked to New Profile were arrested on suspicion of allegedly inciting the youths to illegally obtain the service exemption (see box). Police confiscated several of the activists’ computers. All detainees were released on bail after questioning. Police forbade Hadar and Kisch to communicate with one or with the remaining five activists under investigation. “Israeli society has zero acceptance of our message,” Kisch, who is an artist, told Anglo File on Monday in her usual, animated voice. She says people from the West are “much more receptive” to the group’s ideas than Israelis. “Israel is moving in the direction of the area in which it is located,” she observes. May 01, 2009 “Palestine Chronicle” — – Racism is common to most and probably all societies. Laws never seem entirely to eliminate it. It was the essential tool in the creation of modern settler states. The United States could not have come into existence without the obliteration of North American Indian cultures and of large numbers of the people themselves. They had to die so the US could be born. In Australia the indigenous people of Tasmania were wiped out to the last man, woman and child, while on the mainland the tribes were massacred, confined, stripped of their ancestral land and eventually turned into fringe dwellers. Until recently Australia had a prime minister who could deny that aboriginal children of mixed ‘blood’ were taken from their parents up to the 1930s and refused to issue any expression of remorse for their mistreatment. More recent targets of racism have been Lebanese and Vietnamese immigrants, while the Howard federal government’s racist treatment of Iraqi and Afghan refugees and asylum seekers remains one of the most shameful chapters of Australia’s history. In the US the election of a colored president would have been inconceivable until very recently. It was so unbelievable that people wept when Barack Obama won the elections. Racism comes in many shades. Discrimination against people on the grounds of skin color, ethnicity or religion is a basic human rights issue, a first cousin to discrimination, harassment and denial of opportunity on the basis of gender. President Mahmud Ahmedinejad, in his recent speech at the Durban Review Conference in Geneva, drew attention to Israel as a racist state but Iran has serious issues of its own to deal with. Homosexuality in Iran is treated as a crime. Gays and prostitutes are executed in public. The Bahais have been the victims of discrimination and persecution throughout Iran’s modern history and this remains the case today. They have no legal identity in Iran. On all of these issues, Iran is itself vulnerable to criticism on the grounds of human rights, which does not, of course, detract in any way from his criticism of Israel. The outrage directed against Ahmedinajad obscured the real issue at the heart of what he was saying: is Israel a racist state? In settler societies such as the United States, Australia and Canada, the crude racism which drove invasion and colonization mostly belongs to the past, when there was an active concept of race, allied with the categories of civilization, barbarism and savagery. The North American Indian was regarded by the white settlers as a savage, perhaps noble, mean or cunning, but a savage ‘redskin’ nevertheless. In Australia the indigenous people were scarcely counted as human beings. It was not until the 1960s that they were even given the vote. The same relegation of ‘Negroes’ to a contingent category of humanity (at best) justified slavery and segregation in the southern states of the United States. The dehumanization of all of these groups was essential to the colonizing process (including the colonization of Algeria after the French invasion of 1830) and the enrichment of white settlers. May 01, 2009 “Counterpunch” — A false claim is wafting through the press: Obama is hanging tough with Benjamin Netanyahu, he’s going to “twist Israel’s arm” and at long last force the Jewish state into a two-state agreement, settling the Israel-Palestine question for good. There’s even talk that Obama backs the Arab League’s 2002 peace initiative, complete with its main demand: Israel’s withdrawal to its 1967 borders. There’s no proof for any of this. Obama has said nothing about when, where, and with what boundaries a Palestinian state might be established. Neither did George Bush. The slide from one regime to the next has been seamless on the score of Israel and Palestine as on much else. Obama’s reference to the Arab Peace Initiative was crucial for what it omitted — the proposal’s first part, the precondition for everything that follows: “Full Israeli withdrawal from all the territories occupied since 1967, including the Syrian Golan Heights, to the June 4, 1967 lines as well as the remaining occupied Lebanese territories in the south of Lebanon.” Only after these preconditions have been laid out does the document continue: “Consequently, the Arab countries affirm the following….” In “Consequently,” the intent is unmistakable: Once Israel fulfills the crucial condition requiring Israel’s withdrawal to the 1967 lines, the Arab countries will do x, y, and z. One of the corollaries following the “Consequently” clause reads: “Establish normal relations with Israel in the context of this comprehensive peace [emphasis mine]”. Nothing could be clearer. Moreover, the Arab League’s request of Israel, “the context,” expresses the international consensus for the past 30 years, routinely blocked by the US and Israel. Obama deliberately ignored all of this in his speech. Instead, he patted the Arab League on the head (“The Arab peace initiative contains constructive elements”), calling on Arab states to take “steps towards normalizing relations with Israel, and [stand] up to extremism that threatens us all.” To construe Obama’s remarks as a slip or “mistake,” to suppose that this literate, lawyerly President didn’t actually read the document, would be preposterous. Obama’s choice was a deliberate policy declaration: Israel will continue to do what it is doing, with US protection. The US has found a proxy (and armed it — more on this below). Hamas must “bow its head” to the master’s will. Between the lines that refer to Arab states “normalizing” their relations with Israel, read: the US’s most powerful Arab clients, Egypt and Saudi Arabia, hopefully (though not surely) with Syria in tow. attempt to help make the website better known around the world. 1. Disseminate information about the website’s existence and value, including the link <http://www.israeli-occupation.org/> via email lists, blogs, other websites, word of mouth, etc. Tricky business, boycotts. Take the case of Omar Barghouti. In 2004, the graduate of Columbia in New York helped found the Palestinian Academic and Cultural Boycott of Israel campaign, urging scholars and researchers around the world to cut ties with Israel’s universities. But, as reported in last week’s JC, Barghouti is studying for a doctorate at… Tel Aviv University. Asked to explain this apparent inconsistency between words and deeds, he told Maariv: “My studies at Tel Aviv University are a personal matter…” That’s quite a shift from Barghouti’s previous position which held that academic studies were not a personal matter but highly political — at least if the academic in question happened to be Israeli. After that blow to their credibility, the boycott campaigners are now suffering an even more wrenching fate. One of their heroes is set to defy their call — and head to Israel. An interesting notice appears on the website of The JC.com http://www.thejc.com/articles/new-labour-movement-pro-peace%E2%80%99 under the title “New labour movement is ‘pro-peace’” (30 April 2009). “A new international trades union movement committed to work for peace between Israel and Palestine has been launched this week “to challenge the apologists for Hamas and Hizbollah in the labour movement”. This suggests that there is a recognition by the pro-Israeli Government supporters in the trade union movement in Britain that the efforts of the Trade Union Friends of Israel (TUFI) have badly failed and that they are discredited by their intervention on the side of the Histadrut and the Israeli Government in support of the murderous Operation “Cast Lead” attack on Gaza. Although the trade union conference “season” is only just underway it was noticeable that TUFI did not appear at the NUT Conference in early April and that little has been heard of them for some time. USDAW, the union for the shopworkers and not a union which has debated the issue of Palestine at its conference before has passed an important resolution which shows the sea change that has taken place. This is on the back of the STUC and NUT conference decisions. The JC.Com article completely fails to mention this of course. This is clearly an attempt to smear the boycott as anti-semitic not anti-Israeli Government. Anti-Israeli demonstrators left children in tears but failed to disrupt the Zionist Federation’s annual family show to celebrate Israel’s birthday on Tuesday night. The show was forced to move from the University College London-owned Bloomsbury Theatre at the last minute to the artsdepot in Finchley, north London. 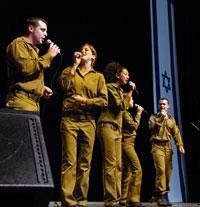 The Bloomsbury claimed that a publicity picture of an Israel Defence Force entertainment troupe, who appeared in the show, breached the ZF’s contention that the event was cultural, and not political. The theatre had received complaints from anti-Israeli groups. The five Israelis — Loren Benjamin Peled, Shaylee Atary, Noga Erez, Reut Raz and Menachem Liav Ben David — appeared on stage in their uniforms to thunderous applause midway through the two-hour show and performed two songs. Then they were hurried away to appear at a British Friends of Israel War-Disabled dinner. In most of the world, May 1st is a day of international labor solidarity. It is a day of joy as workers picnic together with their families and celebrate the achievements of one of the most phenomenal movements of the 20th century. It is fitting, then, that the Free Gaza Movement chooses May 1 to announce the launching of the HOPE FLEET TO GAZA. We are leaving on June 1 as an act of solidarity with the Palestinians, a people who have been massacred, terrorized and suffocated by the Israeli military. The Dignity will carry Mairead as well as two other high-profile passengers, 84-year-old Hedy Epstein, a holocaust survivor and Cynthia McKinney, former Georgia Congresswoman and candidate for U.S. President under the Green Party. McKinney was on the Dignity when it was rammed three times by the Israeli navy on December 30, 2008 when they tried to sink the small sturdy yacht. “We cannot let Israel’s threats and aggression deter us. To do so would give in to violence and concede that might is stronger than right. To do so would turn our backs on our brothers and sisters in Gaza who have been waiting far too long for the international community to stand up to this injustice,” said Huwaida Arraf, one of the delegation leaders on the Hope Fleet. Our boats are a part of a larger flotilla making its way to Gaza loaded with humanitarian aid and building supplies such as generators and electronic equipment for hospital emergency machines. The people of Gaza need cement and lumber and PVC to rebuild their shattered infrastructure, and Israel refuses to allow anything into the small enclave except for food and some medicine. “The Palestinians don’t want hand-outs from the international community. They want their lives back. They want their human and civil rights. They have a great labor force wanting to rebuild their communities. They are perfectly capable of that if their borders, including the sea border, were open,” states Lubna Masarwa, another delegation leader of this flotilla and a passenger on board the rammed Dignity.